Contemporary, sophisticated, spacious, & elegant best describe this custom 3 bedroom, 4.5 bath, 3762 s.f., ocean view residence in the gated Wailea Pualani Estates.The filigreed wrought iron & glass double entry doors are accessed from the semi-circular, lushly landscaped, stamped-concrete motor court. Upon entering, you are âtaken' by the exquisite golden antique chandelier, bathed in bright morning light, that is focused through the East facing circular window, and are, at once, beckoned up the grand stairway to the main living area. Immediately, your focus, through the columned archway, is on the deep blue Pacific Ocean. Abundant Carrera marble wrap-around counters & a full height-back splash compliment the stainless steel Wolf appliances with gas cook-top & a custom white-paneled fridge. 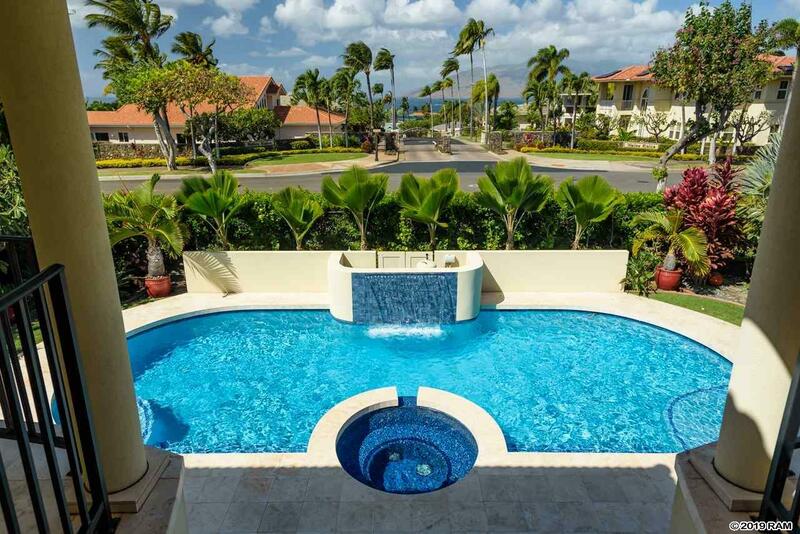 Motorized sliding glass walls retract & open onto a large view oriented lanai which overlooks the fabulous pool, tiled spa, waterfall, & gardens. The large ocean view master & en-suite bath is spa-like, with floor to ceiling book-matched translucent onyx walls, pedestal stone sinks, fanciful mirrors, & the finest fixtures. The spacious en-suite dressing room affords closets galore & enjoys easy access to the adjacent laundry area. An additional den/bedroom & full bath on the upper level plus two-large lower level guest bedrooms with elegantly detailed en-suite baths make this a wonderful home. The large, lower-level, great room opens to the covered pool-side lanai & outdoor BBQ kitchen area and surrounding lush tropical gardens. A short stroll down the hill and you are at Maui's revered Keawakapu Beach. Fine dining, shopping, worlds class spas, golf and tennis are in close proximity. This residence is immaculate and ready to move into! Come Enjoy!